Mercedes-Benz Stadium officially opens August 26. 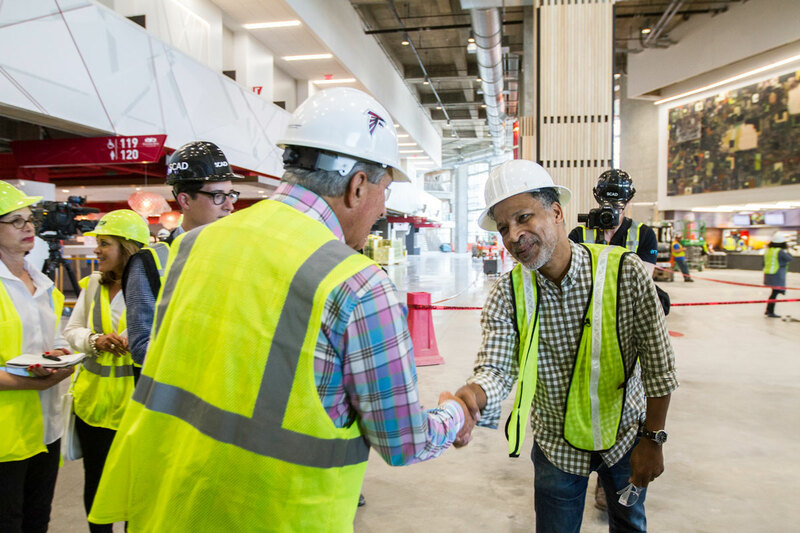 Mercedes-Benz Stadium is finally coming into focus as crews make the final preparations for the August 26 Atlanta Falcons preseason game that will officially open the new home of the Falcons and Atlanta United. 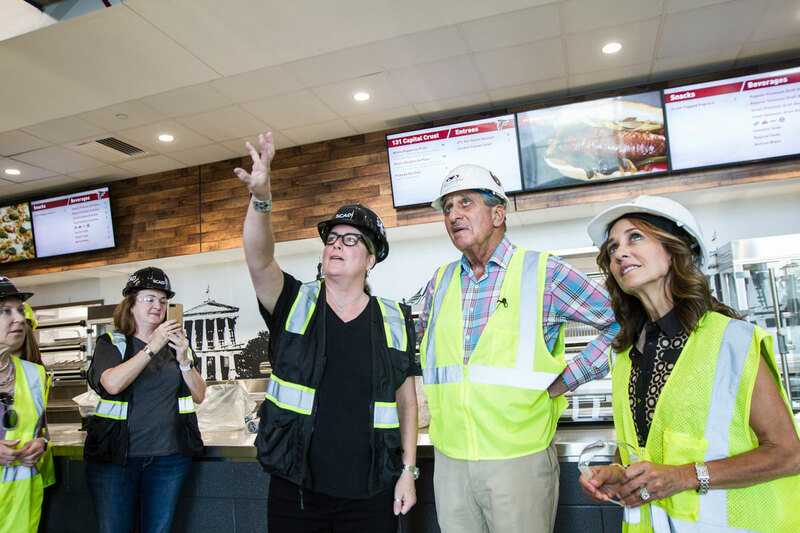 Keeping with the trend of sports arenas becoming more publicly accessible, multi-use complexes rather than just a place to watch the game, owner Arthur Blank and his team envision the stadium being open almost 365 days of the year, integrating concepts like a full-service restaurant that will be open on non-game days. 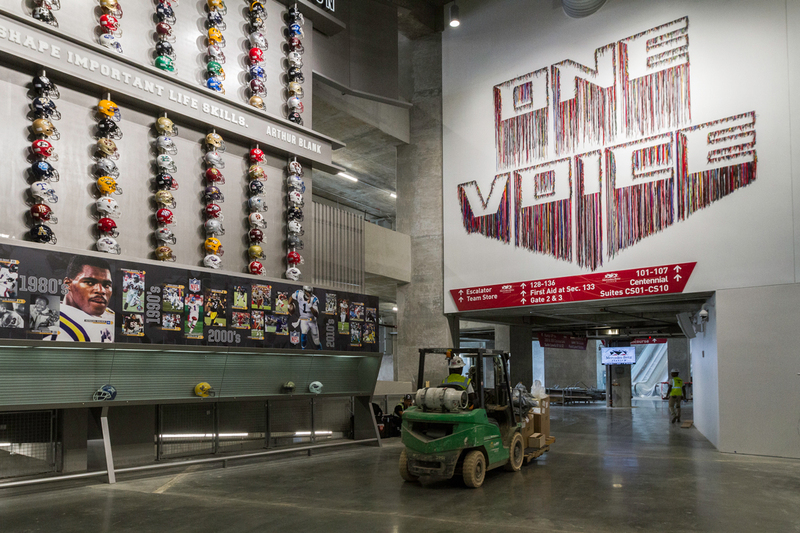 Another facet that will set this stadium apart is its infusion of art. All told, there will be more than 180 pieces produced by 54 artists, 26 of which were sourced from Atlanta and surrounding areas. 45 percent of the artists are from Georgia, while women represent 24 percent of the artists commissioned. 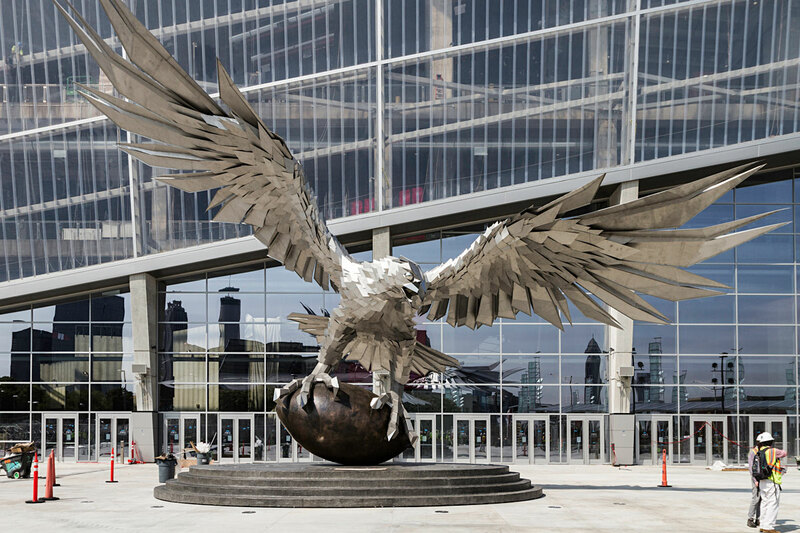 International artists comprised 14 percent of the art produced, including the centerpiece—a massive, angular, metallic Falcon that anchors the main concourse. 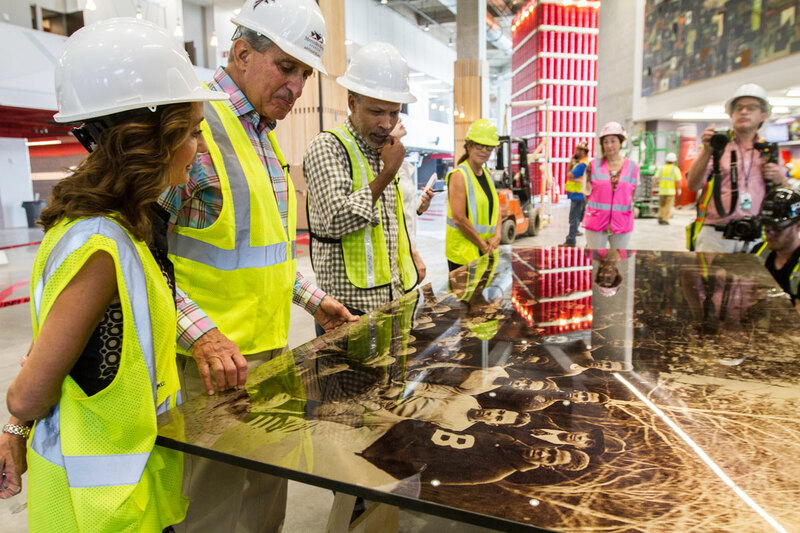 This expansive undertaking took two years and was facilitated by Mercedes-Benz Stadium in partnership with SCAD—who were tasked with curating and overseeing the art collection. From inception they wanted the artists they selected to be indicative of the people of Georgia and visitors to the stadium. Artist Radcliffe Bailey (right) introduces himself to Arthur Blank. Radcliffe Bailey (third from left) discusses his work “Conduits of Contact” with Arthur Blank. Melody Postma’s mural “Love of the Game” continues the theme of mixing archived images into a collage. Her style is admittedly pop, replete with fun action typography and quirky colors meant to reflect the energy and excitement of a football game. She takes a nostalgic look at the origins of the Falcons, electing to use photos from 1968 and 1969, when the team was in its infancy. She also highlights the Falcons’ evolving logo and includes a ticket stub from the first season. “I wanted to pay homage to the beginning. The blue stripes are meant to represent the rising up,” she explains. 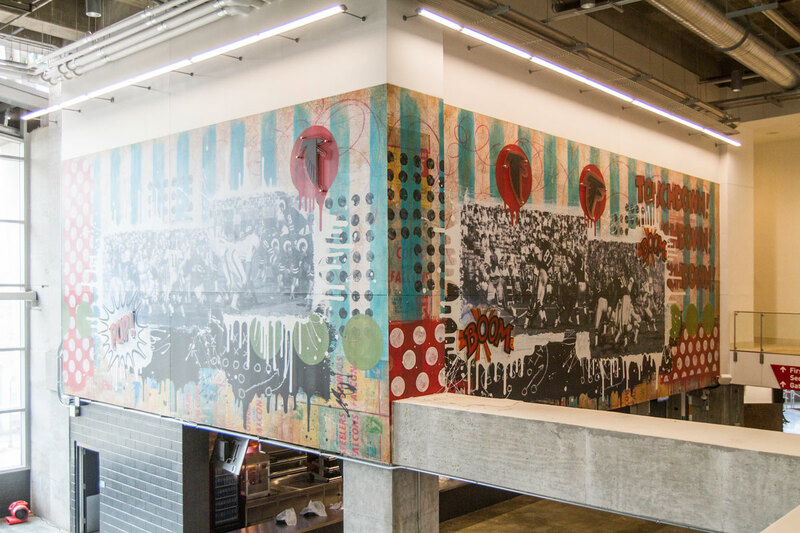 Melody, one of the 20 SCAD alumni commissioned for this project, has four other pieces on display in the stadium in addition to the large mural. “I’m proud to be a part of this, and I think SCAD knocked it out of the park bringing in so many artists,” she says. 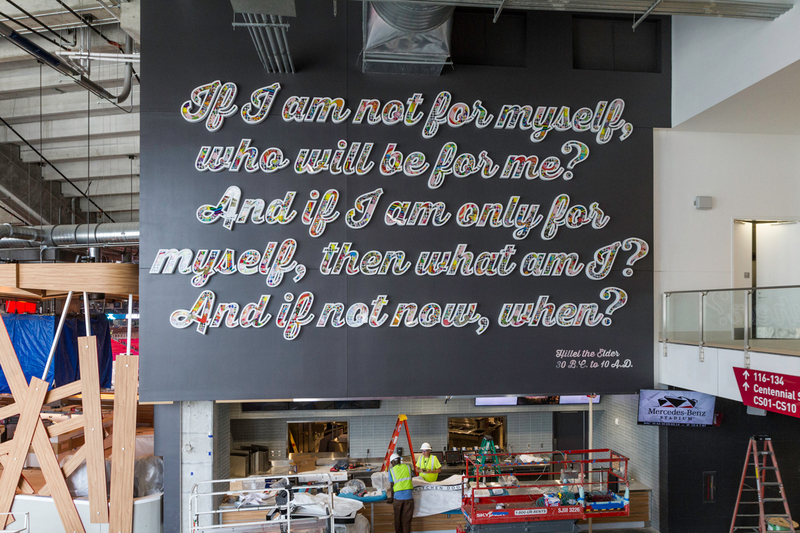 “Executive Function (After Hillel)” by Michael Porten is a lightbox sculpture featuring the Hillel the Elder quote. 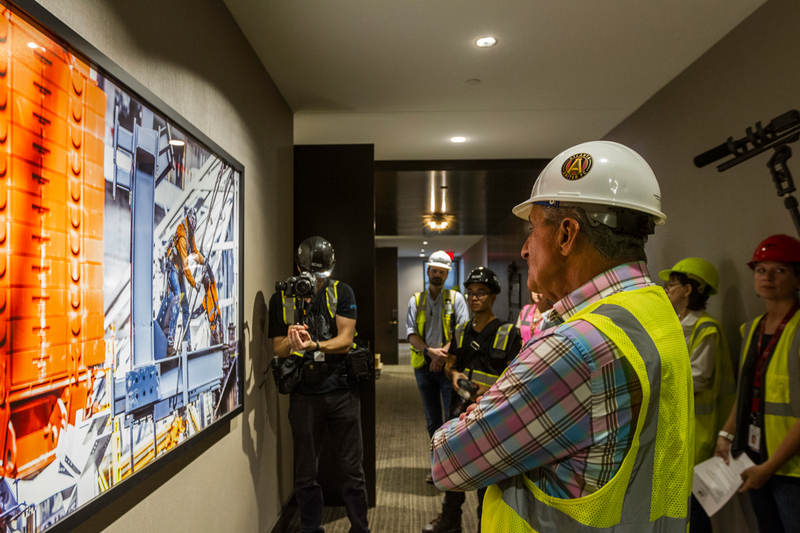 Hsu-Jen Huang’s “Falconstruction” photo series hangs in the Hall of Fame suites. Artist Nari Ward created this piece from shoelaces donated by fans. Not to be left out, the stadium also features soccer-themed art for Atlanta United. The most notable will be a 35-foot-tall soccer ball in the Home Depot Backyard—a green space that will be dedicated to tailgating during home games and a mixed-use community space at other times. 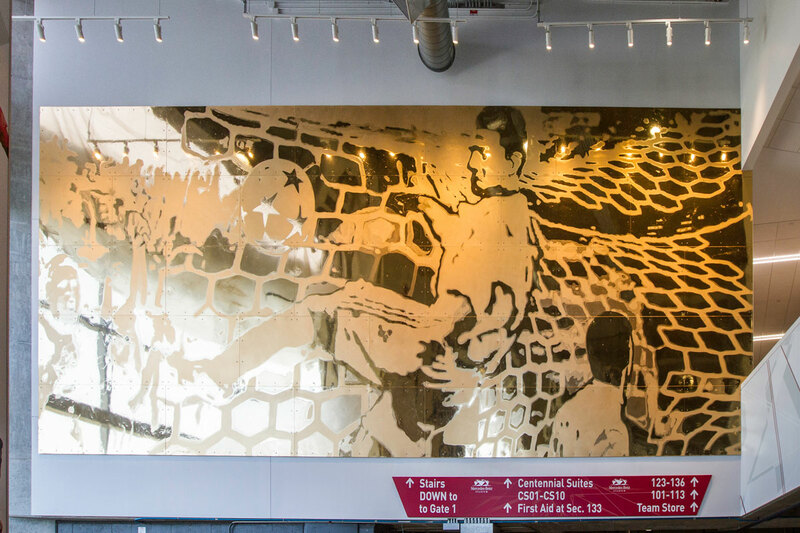 Another standout soccer piece is the aptly titled “Golden Goal,” a large hand-painted mural brushed with gold acrylic by Atlanta artist and SCAD alumnus Jimmy O’Neil.